So onto my cross stitch. Remember the last time I picked up "Best Friend"? I got quite a lot farther. So page one done, I went to a WIP I had put down because I had to frog. 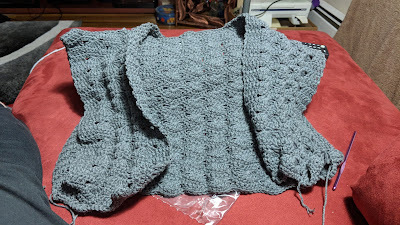 Ended up frogging most of what I had done today (4 rows) and did manage to redo and complete more before taking this photo. But the frog has come to visit this week. I wonder if it's mad that I got rid of the fly that got into my apartment. Took a few cool pictures of the sunset Tuesday night. Also some of Clyde, here's my favorite. The ornaments I had thought were cute a while ago. The last one "Russian Hunting" was an impulse buy, mainly because it was so discounted and I liked the horses. So I have another page finish. Page 6 of the Arab Tent, but it was already halfway done. I probably stopped there because I was tired of all the dark colors. Which is why I won't be going onto the next page just yet. Made a baby blanket a friend commissioned. And decided to try again for the Special Day Cardigan from Annie's catalog again. Still don't know how to get 13 sc to be 4" using a G but the height and back width seem to be coming out to the other measurements listed for the pattern. I also went a little crazy at Mary Maxim's. First they had a BOGO on downloadable patterns. Although I am stitching another tree. 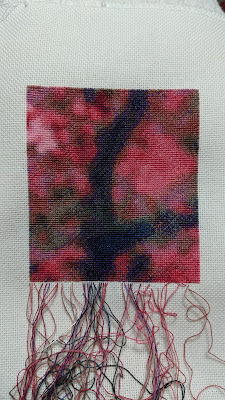 At least it's a pink tree... 90/98 rows. 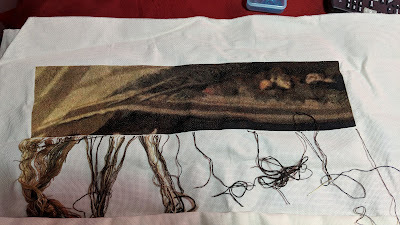 I didn't have quite as much stitching time this week otherwise I probably would've finished the page. I've been thinking of doing flosstube videos. Would anyone be interested in something like this from me? Something you'd like to see? What is the crochet equivalent of flosstube? Yarntube? These are the afghan books I ordered. all for the price of the kit of the stained glass tree one. Cuts down on my having to buy the kits as there are a few that I'm not totally in love with the colors for. And Clyde is weird and doesn't know what to do about snow crab. Looked at it, sniffed it, then finally batted at it. But didn't eat it.